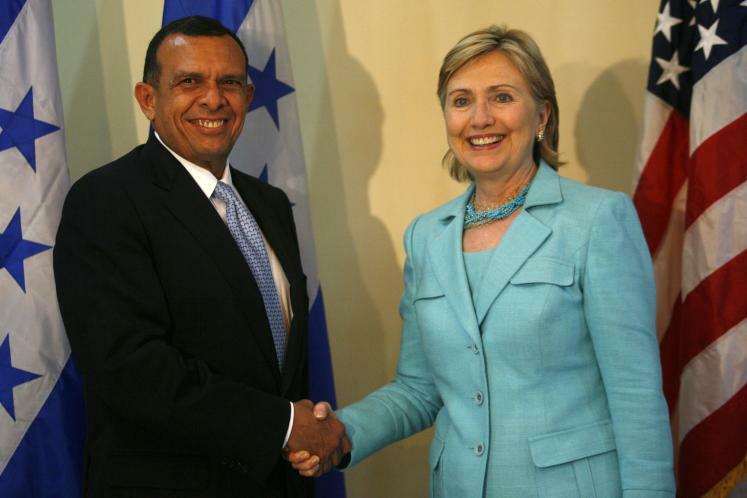 U.S. Secretary of State Hillary Clinton shakes hands with then-candidate Porfirio Lobo, who became Honduras’ president in a disputed election following a coup. In her recent interview with the New York Daily News, Hillary Clinton was asked about policies she was “directly involved in, the coup in Honduras. As you know in 2009, the military overthrew President Zelaya. There was a period there where the OAS [Organization of American States] was trying to isolate that regime, but apparently some of the emails that have come out as a result of the State Department releases show that some of your top aides were urging you to declare it a military coup, cut off U.S. aid. You didn’t do that. You ended up negotiating with Oscar Arias a deal for new elections. “But the situation in Honduras has continued to deteriorate. There’s been 300 people killed by government forces, and all these children fleeing and mothers from Honduras over the border into United States. And just a few weeks ago, one of the leading environmental activist, Berta Cáceres, was assassinated in her home. Do you have any concerns about the role that you played in that particular situation, even not necessarily being in agreement with your top aides in the State Department?” See full transcript. “Second, Clinton says that the State Department chose not to call what had happened a coup in order to avoid having to cut off all aid to Honduras — including humanitarian aid. But this is not what the law would have required; some humanitarian aid ‎is still permitted. “Clinton also admits in her book, Hard Choices, that she worked successfully against almost all of the Latin American governments to prevent the democratically elected president, Mel Zelaya, from returning to his presidency. “Honduran security forces shot protesters and opponents of the coup in the streets, while a wave of repression began against women, the LGBT community and other vulnerable minorities that continues to this day. Her statement about avoiding ‘bloodshed’ is a slap in the face to the family of Isis Obed Murillo, who was gunned down just days after the coup, and others who were killed for standing up for democracy. Her assertion that Honduras could have been on the brink of civil war is ridiculous hyperbole.